Grade 1:ANSI Standard - A156.3, Grade 1. UL Listed:UL and ULC Listed - 2200 Series for panic. Alarm units have an internal horn. When the push rail is depressed, the horn sounds to provide an audible means of signaling that the door has been opened and violated. The unit has changeable 2 minute alarm cutoff or manual reset. Preset at factory for 2 minute alarm cut off. Jumper cable is provided to switch to continuous alarm. The key switch to turn the alarm off is a standard 1-1/4" cylinder with "C" keyway. The alarm operates on one standard 9 volt transistor battery. When battery is weak the horn will emit an intermittent signal. Alarmed units are supplied with two switches. One switch monitors the push rail and the other switch monitors the latchbolt for full proof security. Unit includes "emergency exit only. Alarm will sound" decal for application on door or unit. Door Thickness: 1-3/4" thick standard optional 2-1/4" thick. Stile: 4-1/2" minimum stile width required for single or double door application using standard 239 strike and pull or lever trims. Cover - Nonferrous alloy. 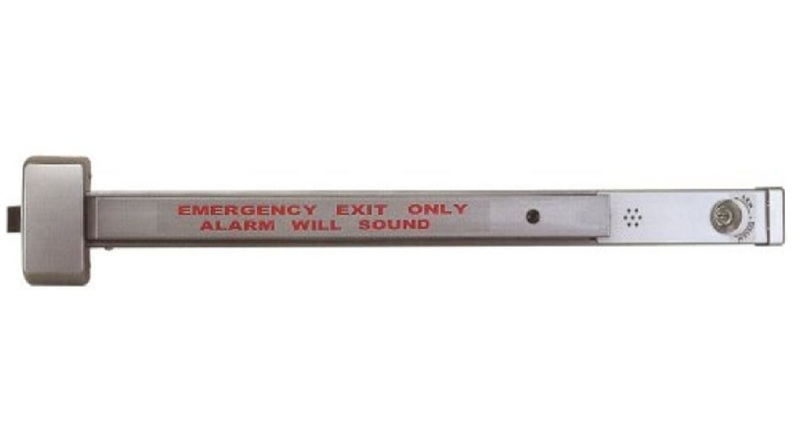 Covers stock hollow metal doors with 161 cutout. Mounting - Furnished standard with wood and machine screws. Available with thru bolts on request. Thru bolts are included and standard packaging on fire rated devices. Hand - Non handed, center hub. UL and ULC Listed - 2200 Series for panic. Note: this model Retrofits Sargent 12-2823 and 12-2838 Series.